Whether you are modifying a computer case or working with models, knowing how to cut acrylic rods may come in handy. Acrylic rods can be slightly deceptive, because small ones look as though you might be able to cut them with shears. Unfortunately, this does not work. However, cutting acrylic rods is quite simple when you have the right tools. Chances are excellent that if you are working with models or modding computers, you may already have the tools you need in your house. Attach the plastic cut-off wheel to your rotary tool. Make sure it is mounted securely. Double-check that you know exactly where you want to cut your acrylic rod. Remember, you can measure and remeasure as much as you like, but you will have to get a new rod if you cut off too much. Mark where you want to cut with masking tape. You can remove it after you have finished cutting. Cut the acrylic rod using the rotary tool at a moderate speed. Do not go too quickly, as the heat from the tool may melt the plastic and ruin your cut. Wear safety goggles or a mask while cutting to avoid injury. Scrape the edges of your cut piece with a sharp razor blade to remove roughness and plastic “hairs.” Do not smooth the cut rod with sandpaper—it does not work on acrylic. Work in a well-lighted area. This will help to ensure that your cuts are precise. Working in a well-lighted area is also essential when using sharp razor blades to cutting small objects. Use the correct cut-off wheel for the job. Rotary tool manufacturers have full lines of accessories designed for use with their tools, including cut-off wheels for almost every material imaginable. Using the correct cut-off wheel will also save you money in the long run, because the job will be done right the first time. Using the wrong cut-off wheel can cause unnecessary wear and tear on the wheel and may result in an inferior cut for your acrylic rod. If your rotary tool is cordless, make sure the battery is fully charged before beginning to work. Few things are more frustrating than running out of power in the middle of a project. Rotary tools can do more than just cut a length of acrylic rod into sections. If you want to cut your acrylic rod at an angle, it is easy. 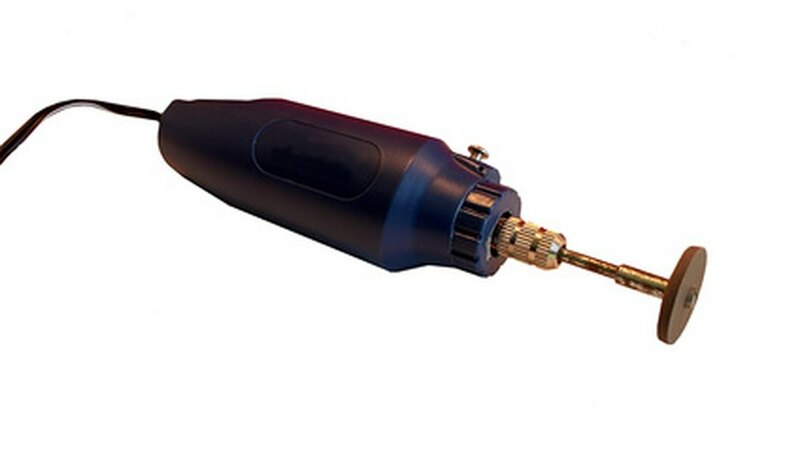 Hold the rod at the angle you want and use the cut-off wheel at a moderate speed so you do not overheat the plastic. If you feel nervous, try cutting the rod to size first. Then use the small end of the rod that you would normally throw away to practice cutting at an angle before cutting that same angle into the piece you want to use.